Prashant Bhushan began practising as an Advocate in the Supreme Court of India in 1983, specialising in Public Interest Litigation. His main areas of interest have been Human Rights, the Environment and ensuring that public servants are accountable. He is associated with various organisations including the Centre for Public Interest Litigation (CPIL), People's Union for Civil Liberties (PUCL), Committee on Judicial Accountability and Transparency International (India). In 2012, Bhushan was the convenor of the Working Committee of the Campaign for Judicial Accountability and Judicial Reforms. The Doon Valley mining case was brought to Bhushan by environmentalist Vandana Shiva in 1983, which was his first public interest litigation. After the 1984 riots, Bhushan became a member of PUCL and took up the cause of human rights. When Bhopal litigation was on and the issue of compensation first came to the Supreme Court in 1988, he was approached by the Bhopal Mahila Sahayog Sanghathan and he eventually volunteered to litigate on the Bhopal gas tragedy that had claimed 15,000 lives. In recent years, he has been involved in extremely scientific and technology related cases, including Koodankulam and 2G spectrum scam cases. Bhushan has authored two books, including one on Bofors scandal. He is one of the three founding members of the Aam Admi Party. Live Law: Former Chief Justice of India Altamas Kabir has on national television called you one of his enemies. Your reaction? Prashant Bhushan: I can understand why he thinks that. It is because I told him to recuse himself from several cases which he should not have dealt with. He also knows that I was openly talking about the fact that his judgment in the NEET case had been leaked well before it was delivered. Although he said it was not leaked from his chamber, but his body language gave him away. It was obviously given to the private medical colleges well before it was given to his brother judge Justice Dave. The draft judgment was ready at least by the first of July because on that date my application was listed before him and that time I had information that the draft judgment was already with these private medical colleges. Therefore, I am not surprised at his statement. Every corrupt judge would regard me as his enemy because I have been speaking out against corrupt judges and corruption. I am not surprised he regards me as his enemy. Live Law: Do you think it is right for a former judge to criticize his brother judges and colleagues on national television? Prashant Bushan: If they have legitimate grounds then they can. I do not believe that dirt should be swept under the carpet and nothing should be spoken about. I think judges should speak and write about their experiences in judiciary so that the country would know how the judiciary is functioning. If there is rot within the judiciary, then it should come out so that things can be corrected. Live Law: From appointment of K.G. Balakrishnan as Chairman of National Human Rights Commission to appointment of Shashi Kant Sharma as CAG, there is an obvious lack of transparency in the appointment procedure by the government. Your comment. Prashant Bushan: Every government wants an arbitrary choice. They want people who will be more convenient for them. They are definitely not interested in any system or in any transparency that would constrain them. Political parties do not even want to come under Right to Information Act. Let us look at the appointment of CAG. The criteria for the appointment of CAG should have been simple based on whether one has understanding of audit, experience of audit; whether one has independence; and whether there would be any conflict of interest. By this standard, Shashi Kant Sharma should have been disqualified. Similarly, in case of Human Rights Commission, one needs a person who is sensitive to human rights, who has understanding of human rights, who has had the occasion to deal with human right issues as a judge or a member of some human rights organization. Besides this, there has to be common criteria that the person has to be honest, upright, and competent, and should be able to function independently. Live Law: With regard to the collegium system, again, there is a lack of transparency in the appointment of judges but can we have an alternative to this system? Prashant Bhushan: We definitely have an alternative to the collegium system. We can have a permanent full time body called Judicial Appointment Commission. A body that is independent of the government as well as the judiciary. A body which can perform transparently by drawing up criteria and by having a system of short listing candidates through which public will come to know who is being short listed and for what reasons. It should also be transparent so that people can provide their inputs. The system should take into consideration their inputs. So that when someone like Justice Cyriac Joseph is being appointed, somebody should be able to point out that he is unfit for the position because he could not deliver judgments on time. Live Law: How is Judicial Appointment Commission, as you propose, different from National Judicial Commission? Prashant Bushan: National Judicial Commission as the government has proposed is an ex-officio body of some functionaries of the government and some judges, but they will not have the time to do this job properly. If one has to do selection properly, one will have to spend time over it. One will be required to go through the credentials of large number of entities and then make a selection from amongst them in a proper systematic and non-arbitrary manner. That requires time. Law Minister, CJI etc do not have the time to do this. One needs a full time body consisting of retired judges, eminent people from civil society and retired officials to be able to do this. In England, Judicial Appointment Commission which was created as part of the reforms following Constitutional Reforms Act, 2005 is a non–departmental public body. It consists of members of civil society, judges and members from the legal profession. Live Law: The leader of the opposition has talked about how clamor for post retirement jobs is affecting the independence of the Judiciary. Your comment. Prashant Bushan: This is because the power of assigning these post retirement jobs is with the government. Therefore, government can patronize judges by giving them jobs when they retire and that compromises their independence. But if this selection is being done by different people then there will be no problem. For instance, what we have argued in the case of Lokpal is that there could be a selection committee consisting of seven people, out of which two would be from the political class who would have conflict of interest i.e. Prime Minister and leader of opposition; and other five would be outside the political class. Live Law: Many legal pundits have argued instead of immediately appointing judges to a post retirement job, a “cooling off” period of two years would suffice and that such a system will no longer interfere with this system. Do you agree with this? Prashant Bushan: Yes, of course, but what I feel is that with respect to retired judges, what jobs should be given to them should be decided by the same Judicial Appointment Commission. If at all retired judges are to be given jobs, it should not be decided by the government. Live Law: From wanting to become a philosopher to becoming a very successful lawyer, how would you describe your journey? Prashant Bushan: Well, I got into law partly because my father was a very successful lawyer. I kind of got into it inadvertently but when I got into it, I got more and more involved with public interest issues of all kinds. My interest became very wide and varied. When any issue of public interest arose, whether it pertained to civil liberty, human rights, corruption, environmental issues or socio-economic rights of the poor, I would happily get involved. Soon, I realized that law should not be seen as means of making money, but as means of making substantial contribution to the cause of justice. One of the great things of being a public interest lawyer is that you come to learn about a large number of important public issues from the persons who are experts in the field on a one-to-one basis, something you could never do otherwise. It’s a very rich and rewarding experience. Live Law: What advice would you give to young budding lawyers? 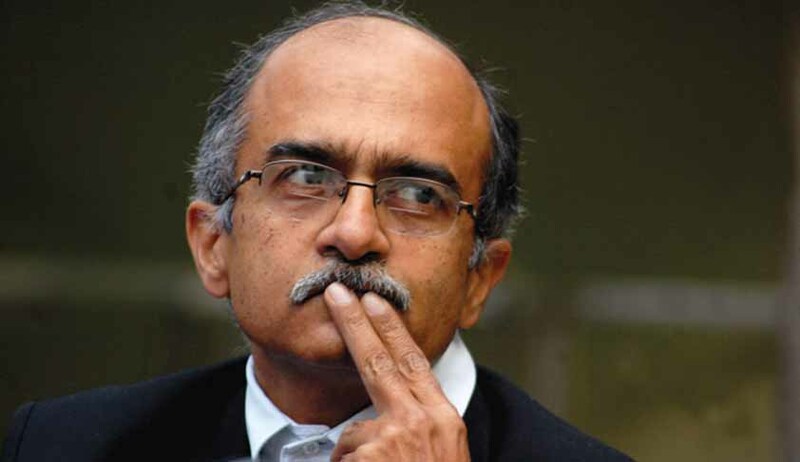 Prashant Bhushan: Do not look at law as a means for making money. Look at law as an instrument for securing justice to people. Engage in issues of public interest. They should understand what is happening in the country and society and should use their professional skills to secure justice to people. Today, very little justice is being done for the poor of the country. Most people do not have access to the judicial system at all or a chance to go to a lawyer, and if they do, most of them languish in court for decades. Even the cases that are decided are very often decided for wrong consideration for corruption and incompetence. There are very few people who are able to get effective justice in the country. Lawyers are too busy making money without contributing much to the cause of justice. Disclaimer : Views expressed are personal of Prashant Bhushan and does not reflect the views of Live Law.